(Long Island, NY) Long Island Cares, Inc., the Hauppauge-based agency that provides assistance to local families in need through food donations and community outreach services, got a boost in its Thanksgiving Adopt-A-Family program from the Suffolk County Legislature. From left, Presiding Officer DuWayne Gregory, Legislator Susan A. Berland, and Legislator Sarah Anker hand off donations collected at the Suffolk County Legislature to Long Island Cares Community Events and Food Drive Manager William Gonyou. Photo Credit: Suffolk County. 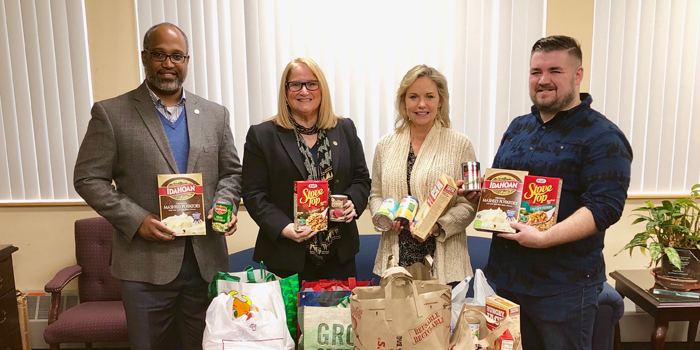 Legislators opened their district offices as drop-off points for the food drive, which aims to provide Long Island families with a full Thanksgiving meal. Long Island Cares estimates that it will be able to help more than 2,000 families this holiday thanks to donations from the community.